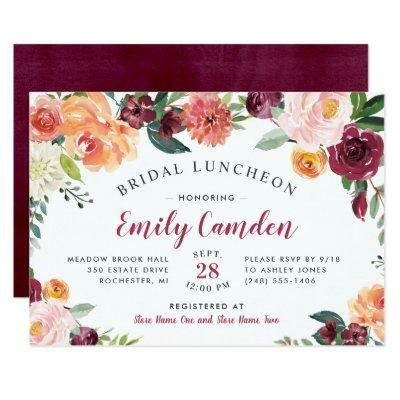 This elegant boho style wedding bridal shower luncheon invitation design features a rustic floral watercolor frame with roses, dahlias, peony flowers, and greenery in a gorgeous palette of burgundy red, golden yellow, peach orange, blush pink, and shades of green. Personalize the custom text with the Bride-to-Be&#;s name, event, and registry information. A burgundy red background with textured appearance dresses up the back of the card.